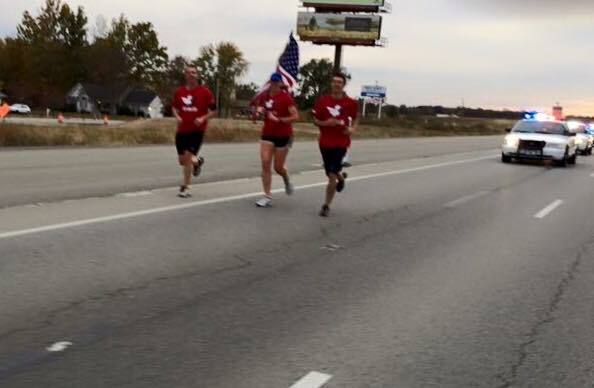 I recently had the privilege to run a small portion of the Old Glory Relay with Team Red, White and Blue. 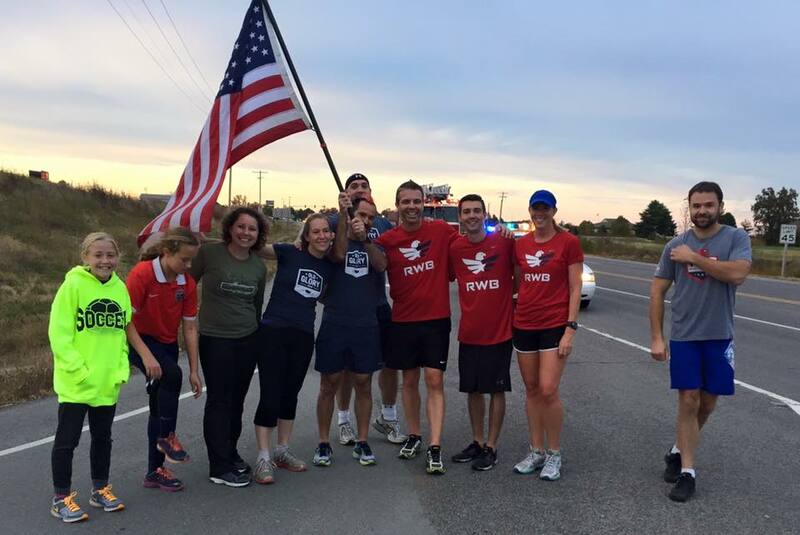 The group started running with the flag on September 11 of this year in San Francisco. 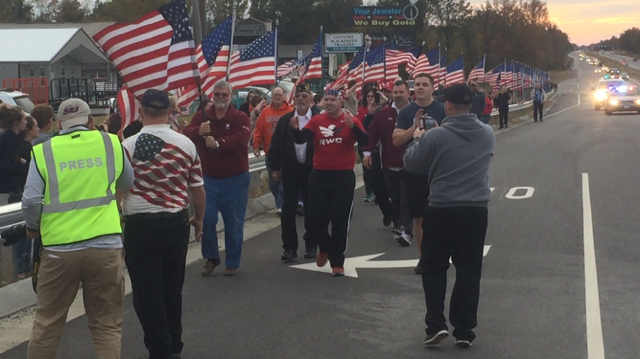 They're passing the flag off to different runners all across the country, eventually ending the relay in Washington, D.C. in November. A couple friends of mine, Tom Harness and Ryan McKennedy, had asked me months ago to be a part of it as the relay came through our town. I accepted the offer and invited others at work to run. Coworkers Ashley Smith and Brandon Merano joined me. 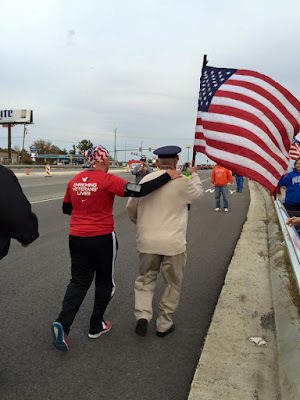 This all went down one day after I ran my first marathon. I'd agreed to participate before checking what was happening the day BEFORE the relay. I let Ryan and Tom know that I'd do my best to run our leg, but I had major concerns. Some people told me running the 3.15 miles would be good for my recovery. Others suggested I was crazy for doing it. (Disclaimer: I'm not saying this to put myself on a pedestal) What put it into perspective for me was thinking about what our troops go through whether they're deployed or just the training they go through after enlisting. Then the sacrifices they and their families make when they're away from home. Top all that with the stress and trauma many experience once they're back in the United States. And lets not forget those who don't make it home at all. It quickly became a no-brainer that 3.15 miles was nothing in the grand scheme of things and no sacrifice at all. I'm so glad I took part in this event. Not surprising our town rallied and showed so much support for the runners and the veterans in this community. 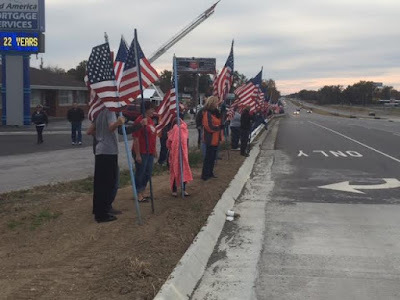 A stream of flags lined the busy highway as young and old gathered. A handful of veterans accepted the flag from the team bringing it to Ashley, Brandon and I which made for an emotional scene. 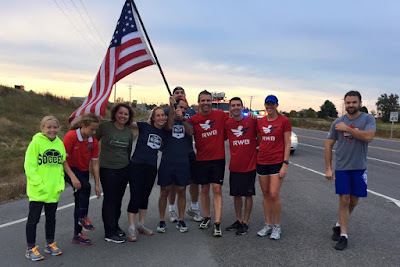 Once we had the flag in hand, our team quickly headed down the highway with local fire and police department vehicles following closely behind. We were greeted with honking horns and waves as we made our way down that 3.15 mile stretch of road. We received thumbs up and shouts of "USA!" People slowed down and snapped photos. I knew I was a part of something special when I signed up, but actually doing it was a whole new experience. I applaud anyone who has ever served our country or plans to so. These men and women deserve our respect and I'm so happy that people in our community gathered to show appreciation as the Old Glory Relay made its way through southern Illinois. Thank you veterans. Thank you friends. Check out drone footage of the hand off shot and edited by Todd Ellis. Very impressive.